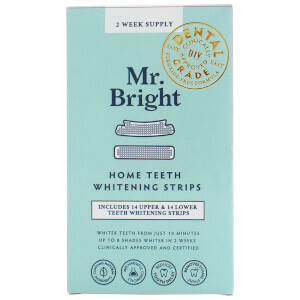 Achieve that perfect, Hollywood smile with the Mr Bright Teeth Whitening Pen; a simple, safe and effective teeth whitening treatment using a minty-fresh, plant-based formula free from damaging peroxide. Designed for convenience and on-the-go applications, the compact pen easily fits into your pocket or makeup bag, with application taking just 30 seconds. See instant results in as little as 30 minutes, with a reduction in tooth stains and discolouration, and up to 7 shades whiter in two weeks with continued use. Clinically approved and certified, smile with confidence with the help of Mr Bright. Sodium Bicarbonate, Chamomile Flower Extract, Aloe Vera, Pomegranate Seed Extracts, Mint.